Probably acquired through (Ambroise Vollard [1867-1939], Paris) by Egisto Fabbri [1866-1933], Florence, by 1920; by whom sold c. 1928 to (Paul Rosenberg et Cie., Paris). Marius de Zayas [1880-1961], and his wife Virginia Harrison, New York, by c. 1930; by inheritance to his wife; (Zayas sale, Parke-Bernet Galleries, New York, 14 October 1965, no. 92); Mr. Paul Mellon, Upperville, VA; gift 1973 to NGA. Published in article on Fabbri collection in Daedalo, 1920. See John Rewald, The Paintings of Paul Cézanne: a Catalogue Raisonné, New York, 1996, no. 438, regarding the dispersal of the Fabbri collection. The 19th Century Heritage, Paul Rosenberg & Co., New York, 1950, no. 2, repro. Post-Impressionism: Cross-Currents in European and American Painting 1880-1906, National Gallery of Art, Washington, D.C., 1980, no. 13, repro. Loan for display with permanent collection, Munch Museum, Oslo, 1981-1982. Cezanne and Poussin: The Classical Vision of Landscape, National Gallery of Scotland, Edinburgh, 1990, no. 33, repro. Französische Impressionisten und ihre Wegbereiter aus der National Gallery of Art, Washington und dem Cincinnati Art Museum, Neue Pinakothek, Munich, 1990, no. 59, repro. From El Greco to Cézanne: Masterpieces of European Painting from the National Gallery of Art, Washington, and The Metropolitan Museum of Art, New York, National Gallery of Greece, Athens, 1992-1993, no. 61, repro. Cézanne, Galeries nationales du Grand Palais, Paris; Tate Gallery, London; Philadelphia Museum of Art, 1995-1996, no. 71, repro. Cezanne and the Russian Avantgarde, The State Hermitage Museum, St. Petersburg; Pushkin State Museum of Fine Arts, Moscow, 1998, no. 14, repro. Art Made Modern: Roger Fry's Vision of Art, The Courtauld Gallery, Courtauld Institute of Art, London, 1999-2000, no. 27, fig. 88. Cézanne: Aufbruch in die Moderne [Cézanne: The Dawn of Modern Art], Museum Folkwang, Essen, 2004-2005, unnumbered catalogue, repro. Cézanne and Beyond, Philadelphia Museum of Art, 2009, pl. 125. Courbet/Cézanne, La vérité en peinture, Musée Gustave Courbet, Ornans, 2013, no. 42, repro. Henraux, Lucien. "Cézanne della Raccolta Fabbri." Dedalo 1 (June 1920): repro. p. 55. Henraux, Lucian. 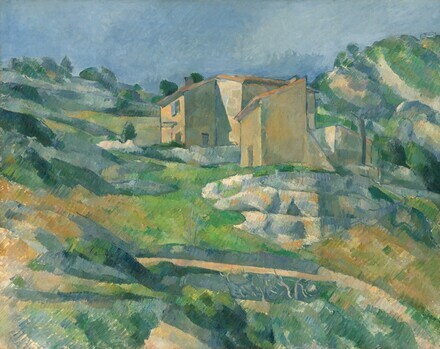 "Une grande collection de Cézanne en Italie. La Collection Egisto Fabbri." L'Amour de L'Art 5 (Nov. 1924):338, repro. Venturi, Lionello. Cezanne, son art, son oeuvre. 2 vols. Paris, 1936: no. 307, repro. Goldwater, Robert. "The Glory that was France." Art News 65 (March 1966): 85, repro. Walker, John. National Gallery of Art, Washington. Rev. ed. New York, 1984: 507, no. 751, color repro. Französische Impressionisten und ihre Wegbereiter aus der National Gallery of Art, Washington und dem Cincinnati Art Museum, Exh. cat. Neue Pinakothek, Munich, 1990: no. 59, repro. Kopper, Philip. America's National Gallery of Art: A Gift to the Nation. New York, 1991: 277, 283, color repro. Naubert-Riser, Constance. Cézanne. London, 1992, 76, repro., as Houses in Provence (Vicinity of L'Estaque). Rewald, John. The Paintings of Paul Cézanne: a catalogue raisonné. 2 vols. New York, 1996:no. 438, repro. Kelder, Diane. The Great Book of French Impressionism, 1997, no. 361, repro. Yamanashi, Toshio. Paul Cézanne, a la recherche de l'absolu, Japan, 1997, p. 70-71, repro. Hand, John Oliver. National Gallery of Art: Master Paintings from the Collection. Washington and New York, 2004: 391, no. 325, color repro. Bardazzi, Francesco, ed. Cézanne in Florence: Two Collectors and the 1910 Exhibition of Impressionism. Exh. cat. Palazzo Strozzi, Florence. Milan, 2007: 262 fig. 23.